The head of the CIA's Korea Mission Center has kept a low profile but should be credited for the recent meetings between Secretary of State Mike Pompeo and Kim Jong Un, according to South Korean press reports. Andrew Kim, the silver-haired aide seen sitting next to Pompeo during his meetings with the North Korean leader, played a key role in improving relations, a senior South Korean official told News 1 on Tuesday. The official said Andrew Kim has been quietly working behind the scenes since the 2018 Pyeongchang Winter Olympics, after Vice President Mike Pence attended the opening ceremony of the Games. "After Pence left, Andrew Kim met with Maeng Kyong Il, the senior official of [North Korea's] United Front Department," News 1's source said. According to the report, Andrew Kim was born in South Korea and spent his CIA career in Bangkok, Seoul and Beijing. President Donald Trump may have called on Andrew Kim specifically to head the Korea Mission Center established in 2017. The center employs about 600 to 700 officers, reports state. 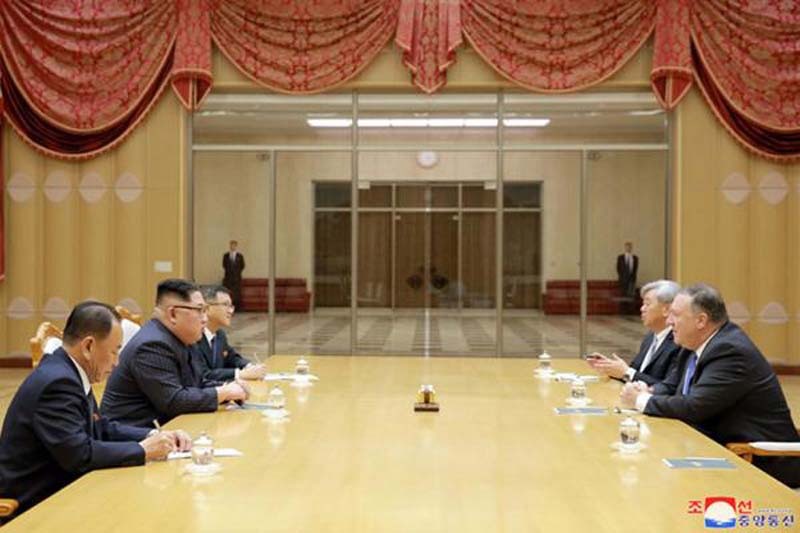 South Korean newspaper Herald Business reported Tuesday the center was responsible for reviewing "20 different military options" during a period of tensions and North Korea missile tests. The center was not only considering military options as threats to the North, but was also already "implementing" military options. That options were underway took the South Korean official "by surprise," according to Herald Business. The official, who spoke anonymously, said he learned about the Korea Mission Center when he met with Andrew Kim in October. Tensions with North Korea have eased, but the United States and South Korea have agreed U.S. troops should stay on the peninsula. Last week, the U.S. House Armed Services Committee ratified an amendment to the National Defense Authorization Act that will guarantee troops stay above 22,000, according to Yonhap. There are currently 28,500 U.S. troops in South Korea.